Kailub Russell edged out Thad Duvall to win Camp Coker Bullet GNCC at Moree’s Sportsman’s Preserve in Society Hill, South Carolina, April 13-14. This makes the FMF/KTM Factory Racer the first XC1 Pro to have multiple wins in the 2019 series. Heading into this weekend’s round, Russell, Rockstar Energy/Factory Husqvarna Racing’s Thad Duvall and Tely Energy Racing KTM’s Steward Baylor each had one win in what has turned out to be a very competitive series. The Camp Coker Bullett GNCC was a highly competitive race, as well, with Duvall crossing the finish less than a second behind Russell after dogging him for most of the final lap. Baylor was also part of the battle, and moved up from sixth to second on lap two before myriad problems kept the South Carolina rider from challenging for the win. Part of the challenge for the competitors was the rain, which started coming down hard about two miles into the opening lap. Most of the XC1 Pro class had to stop for goggles at the end of the lap. Russell grabbed the holeshot to start the race and immediately started trying to pull away from the pack. At the midway point, when Russell saw that Duvall was not going away, he put it on cruise to save his energy for a final push. Duvall took the cue and settled in behind Russell. Heading into the final lap, Russell held the lead with Duvall in second, Baylor in third, while Rockstar Energy/Factory Husqvarna Racing’s Trevor Bollinger and Babbitt’s Monster Energy Kawasaki’s Josh Strang rounded out the top five. Duvall pulled to within striking distance with just a few turns remaining, making for an exciting finish. However, Russell held his ground and cross the finish with Duvall about a bike-length behind. Baylor turned some of the fastest laps of the afternoon en route to third. Bollinger didn’t make a whole lot of noise on his way to a fourth overall finish, which wasn’t his worst finish of the season and it keeps him solidly in fourth overall in the series standings. Meanwhile, Strang, who spent most of the race about fifteen to twenty seconds behind Bollinger, rounded out the top five, in spite of an incident in the first turn that could have ended his race. Josh Toth (FMF/KTM Factory Team) DNFed having reportedly crashed and hitting his head. Ben Kelley continues to lead the way in the XC2 250 Pro class after finishing sixth overall, giving the Trail Jesters KTM rider his fourth-straight win in the class. Claiming his best finish of the year, Andrew DeLong put his Phoenix Racing Honda into seventh overall, just 23 seconds ahead of Husqvarna-backed Layne Michael. Beta USA’s Mike Witkowski rounded out the top 10 and finished second in the XC2 250 Pro division. 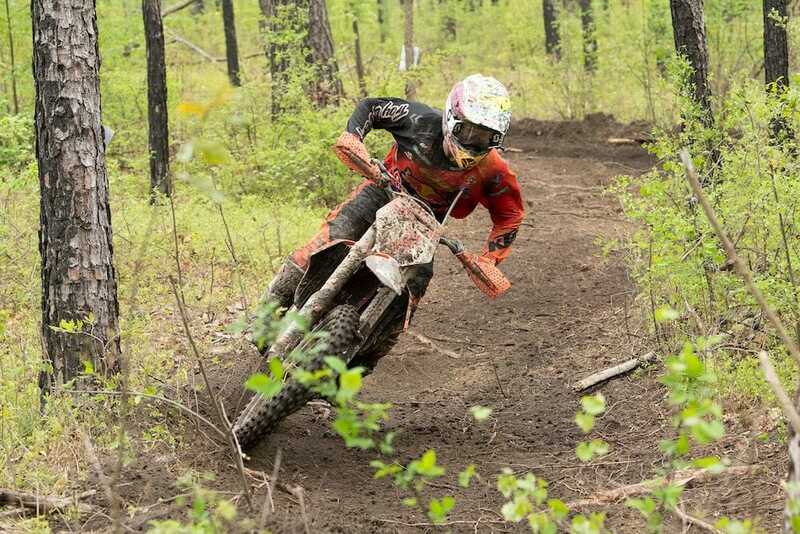 Phoenix Honda’s Austin Lee turned in a good performance for 11th and third in the XC2 250 Pro class. In the FMF XC3 125 Pro-Am class, Trail Jesters KTM’s Jesse Ansley got back on the top step of the podium two successive runner-up finishes behind Beta USA Factory Racing’s Cody Barnes. Ansley was 14th overall this weekend, while Barnes was second in the class with a 19th overall finish. Yamaha-mounted Anthony Federico was third in the FMF XC3 125 Pro-Am class with a 30th overall finish. With four rounds in the books, Russell sits atop the overall series standings, while Duvall sits 13 points back in second. Third overall belongs to Baylor, another 10 points back. Click here for all the latest GNCC racing news.